If my blog subjects boil down to history, murder and fitness, I guess that’s okay. Whatever, here’s a switch-up from the previous post. This is about how I sometimes like to do workouts designed to be entirely divisible by the number five. This is called making my weirdness work for me. I’d stop short of saying I’m obsessed with the number 5. I think I just like the neatness of dividing and multiplying with it. Anyway, I’m a weirdo and here’s the workout I did tonight. This isn’t a suggested workout. In fact, maybe you shouldn’t try it, since I enjoyed it partly because I set up the whole weird divisible by 5 deal. All that said, I was bushed when I finished. I bought The Rack about a year ago. It spends a good part of the week holding up my and my wife’s “clothes not dirty enough to wash that we might wear again this week–in a pinch.” However, I use the damned thing every week for its intended purpose, and I love it for that. 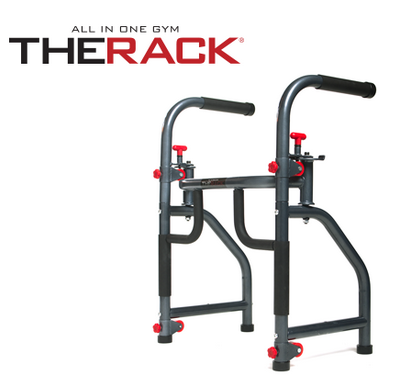 Go here to see non-semi-dirty clothes hanger uses for The Rack. 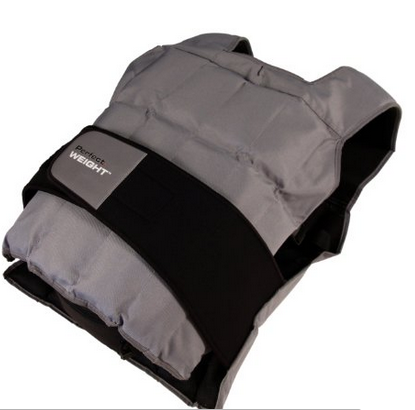 The Perfect Weighted Vest is not exactly perfect. I bought this to have maximum poundage (40 lbs when all slots are filled), but discovered pretty quickly the design of this vest is such that any kind of fast-moving, complex bodyweight move while wearing it is rendered tougher than it should be because the vest tends to fold and curl. The problem seems to be the flap below the velcro clasp. That said, it does its job, for the most part, which is simply to add weight to make bodyweight stuff even harder than it should be. I’ll probably get a less flappy vest in the future but this is fine for now. What? 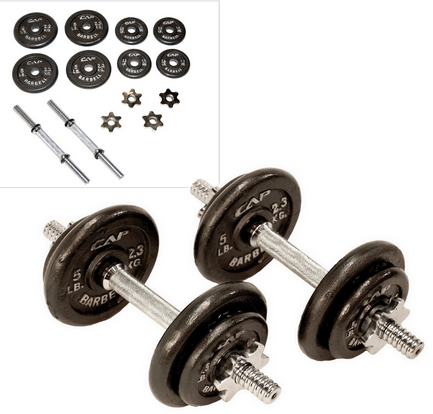 They’re dumbbells. I used two, loaded with 35 lbs. I finished the last reps of the final set of Arnolds (named, yes, after Ah-nuld Schwarzenegger) as the timer beeped. This added up to 25 dips, 50 burpees, 25 curls, and 25 Arnolds. All while wearing the 20-lb. vest. The vest combined with the enforced 20-minute limit made all the difference, I’m certain–especially with burpees. Once I managed to secure the velcro straps well enough that they wouldn’t come undone, every set of 5 felt progressively more brutal and taxing. And it was all, including the enforced 20-minute time, divisible by five. Because I’m weird, and I’m fine with that.